Split ends is one of the most prominent and common hair problem faced by any and every women irrespective of age, hair types and the products she uses. 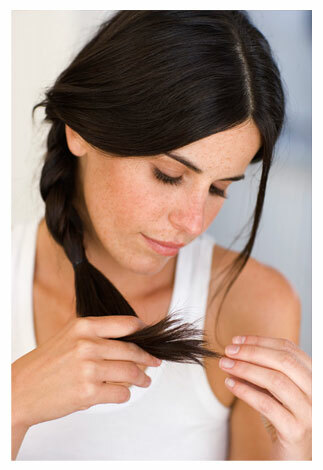 This article shall take you to the root cause of split ends in hair. Split hair ends are common with women with long hair, but women with shorter hair too fall prey to the split end devil. People often condense the cause of split hair ends to irregular trimming of the hair, but there are various other reasons too which cause split hair ends. Hair usually splits into 2-3 strands and 2-3 centimeters long. Split ends tend to happen not only at the ends of the hair, but they can readily happen anywhere, where the hairs are damaged. Long hair: Since the hairs grow long, the natural oils of the hair are unable to reach the tips of the hair, making them dry and resulting in split ends. Exposure to the sun also causes split hair ends. Hair aging is also responsible for hair splitting. Vigorous toweling of hair after baths is the key culprit of hair split ends. Similarly hair tends to split more in the summer seasons. The temperature of the environment is also responsible fr hair splitting. Not just summers, extreme cold or exposure to water (rain) also causes split hair ends. Regular Hair straightening and hair perming also causes spilt ends in hair, again the high temperature of the straightening irons result in splitted hair. Irregular trimming (which is supposedly the good old reason for split hair ends) is also a prominent cause for split hair ends. This does not mean visiting the salon every week. 😛 A little bit of extra gyaan on this point, in the older day women actually burned their hair ends to avoid hair splitting. Trimming with inefficient and blunt scissors is also bound to give you split ends. Excessive cleaning and washing your hair, boosts hair splitting. Hair coloring causes split hair ends. A lot. ( I have colored hair ask me.) Not just hair coloring, hair braiding and extensions also cause hair splitting. Hair bleaching not only destroys the cuticle of the hair, but also causes a dryness and frizzyness which is thereby prominent reason for hair split ends. Cheap and bad quality brushes and combs also cause split hair ends. Very fine teethed combs or sharp teethed brushes also cause hair splits. Brushing or combing hair whilst they are wet augment hair splits to a very large extent. Hair styling also causes split hair ends. Metallic clips and barrettes or even metallic combs and brushes cause hair splitting. Uncovered plastic rubber bands, cause hair splitting. Satin pillow covers also result in hair split ends. Rash combing or back combing the hair may result in dead hair ends with branching splits. Highly Chlorinated water also causes split hair ends. Similarly salty water is responsible for split hair ends too. Blow drying the hair, is the most prominent reason for hair splitting. Abuse of hair products, like serums, straightening lotions and various gels cause hair splitting. Alcohol based hair products, which refer to any products which contain alcohol be it the mousse, the gel or the serum is responsible for dry splitted hair. Isopropyl alcohol must be checked for, avoid products containing it. Your diet also plays an important role in augmenting and decreasing split hair ends. 🙁 Lack of nourishment and various deficiencies cause hair split ends. Lifestyle of a person may also result in hair splitting. i got some split ends too… i get my hair trimmed often to get rid of thm ..
satin pillow covers cause split ends…….sachi ……?????? Ritika you have to give me atleast 48 hours. I cant reply to mails so quickly. I am sorry. my hair has become sucha amess and finding a good and reasonable parlor is such a pain in the US. shud I cut them myself? I have very long hair (it goes behind my waist) and a lot of split ends. I am looking for your blogpost about split ends cures… especially about the diet aspect… I have not only split ends, my nails are thin and brittle and my lips are very dry… I think all these have one reason. but i read smehwre that we should replace cotton pillow overs with satin becoz satin is easy on hair…and does not absorb moisture from hair unlike cotton…. soo many celebs abroad say thats one of their good hair secrets-satin pillow covers..! !